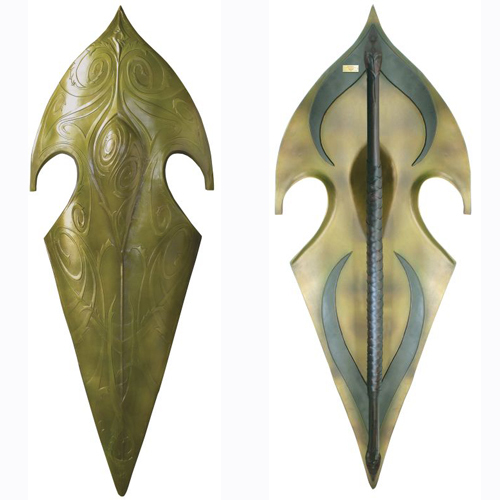 The High Elven Warrior Shield is a reflection of the stately army of Elves that fought against Sauron and his forces, and was designed around a leaf motif, adorned with an elven vine design to reflect the organic nature-based culture of the Elves. This authentically detailed shield is a reproduction of the shield prominently featured in The Lord of the Rings, The Fellowship of the Ring presented by New Line Cinema. United® Cutlery Brands, industry leader in fine movie reproductions, has meticulously recreated the actual prop shield using the finest grade materials and craftsmanship of the highest quality available. Close attention to quality is a top priority in every piece. This meticulously detailed shield is crafted in fiberglass-reinforced cast resin, similar to the movie prop, and features an Elven vine design on the antique-finished shield face. Each shield is presented with a mounting bracket to display the shield. This adult collectible is strictly limited to 5000 pieces worldwide and is individually serialized on a solid brass plate mounted on the back of the shield to ensure authenticity. Includes a parchment certificate of authenticity, along with a second certificate personally autographed by production designer John Howe. Mr. Howe designed the High Elven Warrior Shield and many of the other props featured in The Lord of the Rings trilogy of feature films, presented by New Line Cinema. Shield Material: Fiberglass-reinforced cast resin, Elven vine design, antiqued finish, aluminum and wood handle, genuine leatherwrapped grip. Mounting Bracket: Cast metal. Includes a braided leather strap that attaches to the handle for hanging. Hardware, instructions included.